After almost 8 months of wintering over, moisturizing, hovering and nail biting, the moth has finally emerged from the cocoon I found in the leaf litter last October. I even took the cocoon camping with me – I did not want to miss the big event! 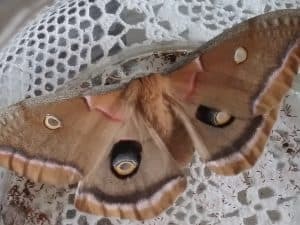 Introducing my Polyphemus moth. morning tomorrow, you will find the two moths attached at their back ends. They will remain paired like this until dusk the following evening. Then, he will fly off seeking the scent of another. (if he is not spent from the first breeding with your moth), and she will head out on her first egg-laying trip. She will likely lay many right in your yard if she finds the right host trees (and Polphemus moths use many different species like oaks, maples, elms, willows, and poplars among others). You will have a good chance then, to perhaps find more cocoons in your yard this fall, too. I currently have 45 Polyphemus cocoons from larva that I raised on elm and willow last summer. Have not had any emerge as yet this spring, but expect the first any day now. Barb’s follow-up: Thank you for the wonderful information, Tim. Last Friday morning I discovered she had emerged and her wings were extended fully. I feared she had emerged the previous day and I had failed to discover it. I knew from an article I read that she had three days to mate, so time was of the essence. So, that night, I took her outside on my hand after dark. She had climbed up my arm, had her wings straight out and she was vibrating. I wanted to set her on the trunk of my maple tree, but as soon as the night breeze touched her, she was off and into the night air. I know she flew across the street disappearing into the night. I am hopeful she successfully found a mate. I am totally fascinated by your email. They stay attached till dusk?? The spray can out of her bottom? I never knew moths were so complex and interesting. I am keeping your email and address for future reference. You must have all the right equipment for your 45 cocoons. If you ever do an open house, let me know. Many thanks, Tim! Next time I rake my lawn, I will be more vigilant. And maybe I will start checking the tree for larvae.